The Southern Association of Colleges and Employers is a 1,000+ member organization of human resources, college relations, and career services professionals representing employers and universities throughout the southeast. Learn more about SoACE. By joining SoACE, you and your organization can become a part of 15 state regional network of college and university career services administrators and employer representatives for networking; cultural and geographical development; professional development; best practices & trends; consulting services; diversity initiatives; branding opportunities and more! 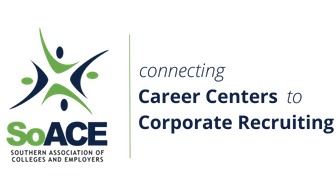 Spread the word about SoACE to your career fair employer attendees by including this advertisement in your employer packet/handouts. The SoACE membership year runs from July 1 - June 30 of every year. SoACE is now accepting new member, group and renewal applications for the 2019 - 2020 membership year. Click here to view membership fees. Need to update your account? If you need to update or transfer memberships within your organization, please contact the SoACE Office. Learn more about membership categories or the group membership option. The Summit will take place June 19 - 21, 2019 at The Westshore Grand in Tampa, FL. Registration is now open! Learn more about the 2019 Employer Relations Summit! The conference will take place December 9 - 12, 2019 at The Peabody in Memphis, TN. Network with career services and college recruiting colleagues. Get up-to-date information on trends and issues affecting the profession. Learn best practices that you can adapt for your program. Benchmark with like organizations and institutions. Explore new and emerging technologies. Share challenges and solutions with your professional community. Learn about new products and services for the field that can help you cut costs and increase your productivity.